The moment David Robertson signed with the Phillies, the Yankees were going to sign Zach Britton. They didn’t have a choice. 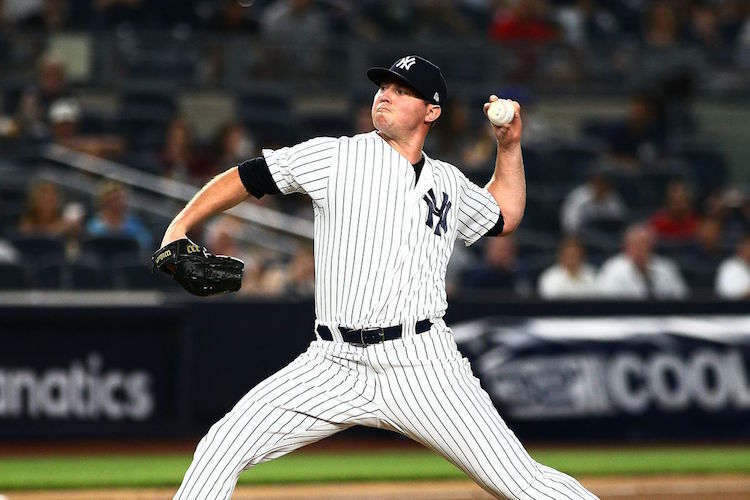 The Yankees went into the offseason knowing they would need to re-sign or replace both Robertson and Britton, and once Robertson was off the board, it was inevitable Britton would become a Yankee again, the same way J.A. Happ became a Yankee again after the team let Patrick Corbin sign with the Nationals. The foundation of Britton’s contract is for three years and $39 million, but it also includes a club option and player opt-out, which could increase the total to $53 million. In this new, weird way of free agency, which will most likely lead to a strike, the options and opt-outs are the new way of doing business. It’s a fair deal for a once-dominant reliever who still might not be all the way back from rupturing his Achilles, and it’s a bargain compared to what I thought he might get as a free agent with the potential of being some team’s “closer”. Last year, in 25 games and 25 innings as a Yankee, Britton was only the Britton Yankees fans grew to hate about half the time, maybe a little more than half the time. His strikeouts were down and his walks were up and his sinker, which made him an elite closer in 2016-17, didn’t have its usual sink. It was all expected from a player essentially rehabbing his Achilles injury in actual games in the middle of a pennant race. The Yankees aren’t getting the 2016-17 version of Britton, who pitched to a 1.22 ERA, striking out 153 in 132 2/3 innings, while racking up 83 saves. But they need to not get the newer version of Britton, whose strikeout numbers have declined by over three per nine innings and whose walk totals have gone by about two per nine innings since his back-to-back All-Star seasons. And I think they will get a better version Britton in 2019. I expect Britton to be better in 2019 than he was in 2018. He has to be better in 2019 than he was in 2018. The bullpen was the so-called strength of the 2018 Yankees even if it seemed like one of the “A” relievers was having an off night every night. But that bullpen featured both Britton and Robertson and now it has only Britton, which means Robertson needs to be replaced. When you consider Britton isn’t that far removed from rupturing his Achilles, the inconsistent last season for Aroldis Chapman, the fact Dellin Betances can get out of whack at any second and the dramatic decline in strikeouts and performance from Chad Green from 2017 to 2018, without Robertson, the bullpen has the potential to be the biggest question mark on a team, which boasts a right-handed dominant lineup and a rotation full of injury history. Add in an inconsistent Jonathan Holder, the frustrating Tommy Kahnle, an inexperienced Stephen Tarpley and the possibility of everyone’s favorite Yankee Luis Cessa joining the bullpen , and there are going to be a lot of cocktails being made in the late innings in homes throughout the Tri-state area this season. Britton was always part of the offseason bullpen plan and when Robertson signed with the Phillies, he became the offseason bullpen plan. But the Yankees can’t replace Britton and Robertson with just a one-year-older Britton. They need another elite reliever. They have to have another elite reliever.